We have several types as well as sizes and colours of bottles available for bottling your beer. Everything from plastic to crown capped glass, to EZ-cap flip top glass beer bottles, to glass AND Stainless Steel Growlers! 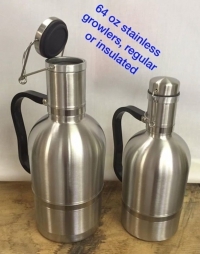 We now carry 64oz stainless steel growlers in double wall insulated and single wall regular styles. Details and pricing listed with bottles below. A great gift idea for the home brewer in the house! EZ-Cap system removes the need for purchasing and using crown style caps. 12 Litres total filling volume per case. Carry handle accessory now available! This style of bottle is rated for approx 100PSI. 6 Litres total filling volume per case. Quality glass reusable bottles for use with crown caps. 650ML CRAFT SIZE OF GLASS BEER BOTTLES! 7.8 Litres total filling volume per case. NEW to our stock - 32oz (0.95L) GROWLER style glass beer bottles. 12 x 32oz bottles per case. Exclusive to The Home Vintner! You don't need to go to the pub to get draft craft beer - you can make it at home. It’s a common refrain among craft beer drinkers that beer is the new wine. And now, rather than buy a bottle of wine to take to a friend’s for dinner, you can take a growler with your own fresh craft beer. These bottles include a one time use metal cap. Extra caps available. To prepare the cap for use, soak for 1-2 minutes in HOT water prior to sealing your bottle. This will soften the seal to make it pliable. NEW to our stock - 64oz (1.90L) GROWLER style glass beer bottles. 6 x 64oz bottles per case. Plastic reusable bottles that come with screw on style plastic cap. Additional plasic caps available separately. 12 Litres total filling volume per case of 24. Suitable for carbonated beverages such as beer, wine coolers or soda. 500 ml size, CLEAR bottles. Recommended for wine style coolers or soda. Premium quality 64oz INSULATED Stainless Steel Growler. Keep your beverage cold - (or hot) for extended periods of time, while retaining freshness and carbonation. Can be used for beer, wine or Kombucha as well as hot drinks. Never worry about breaking your glass growler again! This is a perfect product for the at home brewer. Pre-chill in the fridge for a few hours, then fill with your home brewed craft beer. Instant on hand home brewed beer, free from sediment and ready to enjoy! Can also be used for chilled wine or Island Mist refreshment beverages. 18/8 premium food grade quality stainless steel. Insulated double wall design with no plastic or BPA's and no glass. Includes a large easy grip handle. Large aperture mouth for easy fill. Food grade silicone (removable and washable) seal for lid. Replacement seals are available. 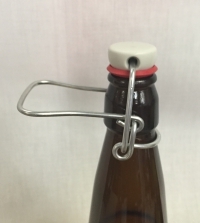 Swing top latch design to keep your beer fresh! *Not recommended for use in dishwasher. Premium quality 64oz regular Stainless Steel Growler. Keep your beverage cold - (or hot) for long periods of time, while retaining freshness and carbonation. Can be used for beer, wine or Kombucha as well as hot drinks. Never worry about breaking your glass growler again! This is a perfect product for the at home brewer. Pre-chill in the fridge for a few hours, then fill with your home brewed craft beer. Instant on hand home brewed beer, free from sediment and ready to enjoy! Can also be used for chilled wine or Island Mist refreshment beverages. All Caps and Washers available to pair with the bottles sold in our stores. Please check below for these new products. 5 cm and 6 cm diameter replacement seals for Stainless Steel Growlers. Replacement caps for all of our plastic style of bottles. Fits 500ml as well as 1 Litre sizes. Crown caps for use with glass beer bottles. 150 per bag, packaged by weight. Not recommended for use with twist off style glass bottles. Replacement seals for use with the EZ-Cap bottle system. This accessory is to attach to your existing flip top apparatus that comes with your EZ-Cap bottles. Same grade and quality as existing apparatus. 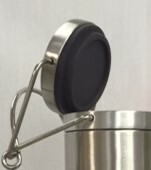 Replacement caps for your Growler style jugs. These are one time use caps. These caps require preparation prior to use. Soak the caps in HOT water for 1-2 minutes prior to sealing your bottle. This will soften the seal to make it pliable. We have several sizes and colours of wine bottles available. All our bottles are high quality for better storage. Clear, smaller (375ml) bottles that are often used for Ice Wine. Comes in cases of 24, for total filling volume of 9 liters per case. Green Bordeaux, smaller (375ml) bottles that are often used for Port, Sherry or Reisling style of Ice Wine. Comes in cases of 24, for total filling volume of 9 liters per case. High quality 750ml clear wine bottles, sold in cases of 12. Total filling capacity per case is 9 litres. Traditionally used for white wines. High quality 750ml green wine bottles, sold in cases of 12. Total filling capacity per case is 9 litres. Traditionally used for red wines. These reusable bags will hold up to 4.5L of your favorite refreshment beverage or ready to drink wine. They can go into your original wine (kit) box for on-tap drinking, into reusable box, or into a wine cask. Wine will not continue to improve or age in a bag, designed for quick drinking options on lighter style beverages. Equipment geared to the bottling stage to make the job easier. Can hold up to 72 bottles after cleaning to allow bottles to drip dry. Each section of 9 prongs can be removed to adjust size of stack as required for space or volume. This is the best invention since beer. Period. Attach it to the end of your syphon hose, drop it into the bottle and let 'er rip. Lift it up when the liquid reaches the bottle lip and the flow will shut off so you can move to the next bottle without spilling a drop. No more diving for the hose shut off clip! Leaves the perfect amount of head space every time, so all your bottles fill the same. Forget about "topping up" between bottles. Every home brewer needs one of these! A handy tool to assist with sanitizing bottles prior to bottling. The pump action pushes the sanitizing solution to the very base of the bottle, allowing the bottle to drain back into the reservoir for the next bottle. Long stem for ease of use with assorted wine or beer bottles. Adapter threaded to pair with the stainless bottle washer. One Gallon Jugs and the various options to seal. This one gallon glass jug differs from our other jug in that it has a wide mouth for easy access. This jug includes one white plastic lid with it. One gallon size. Suitable for storage when paired with black screw top lid. Also suitable for brewing small batches of home style beverages when paired with the white cap (with a hole) and an airlock. Pair with the one gallon jug when you wish to use the jug for storage and require a seal. Pair with the one gallon jug and an airlock when you wish to use the jug for fermenting a small batch of home style beverage. Large white plastic replacement lid to pair with the wide mouth one gallon jug. Everything required to bottle champagne. Pressure bottles, plastic corks, cages and foils. Rental of our carbonation system is done through contacting our NW location. High quality champagne bottles for use with any pressure carbonated beverage. Foils to place over the tops of capped and wired champagne bottles. Available in Gold, Silver and White. Please specify color preference to match your labels. Wires to pair with champagne bottles and plastic corks. A good firm fit below the rim of the plastic cork is required to help hold the cork on the bottle under pressure. If you have never worked with wires before, please contact one of our stores for tips or suggestions.